Undernutrition and obesity are the two sides of malnutrition, and together they contributed to the loss of billions of dollars for economies in Latin America, a United Nations-backed study has found, warning that unless more is done to mitigate this health burden, the region faces a “frightening” future. The Cost of the Double Burden of Malnutrition, released yesterday, is the result of a partnership between the UN Economic Commission for Latin America and the Caribbean (ECLAC) and the UN World Food Programme (WFP) and calculates losses in productivity, health and education in Chile, Ecuador and Mexico. While undernutrition undermines physical growth and impairs brain development, overweight and obesity can lead to non-communicable diseases such as type II diabetes, hypertension and cancer. Together, they inflict a ‘double burden’ on countries and people as they hinder the development of individuals, the well-being of communities and the goal of reaching Zero Hunger by 2030. According to the study, gross domestic product (GDP) in each country shrinks every year as a result of losses is productivity caused by this double burden. Losses are estimated at $500 million in Chile, $4.3 billion in Ecuador and $28.8 billion in Mexico, which represent respectively 0.2 per cent, 4.3 per cent and 2.3 per cent loss of GDP. “Over the last decade many middle income countries have made great inroads into reducing undernutrition. Yet the problem persists and we now witness a worrying trend among vulnerable communities with cases of undernourishment and overweight simultaneously within the same families,” said WFP Regional Director, Miguel Barreto. “The double burden of malnutrition increasingly affects the poor and vulnerable population, thus becoming another cause for the current inequality in our region,” said ECLAC Executive Secretary, Alicia Bárcena. The implications for the future of countries are frightening. According to the study, undernutrition is declining, but ‘overnutrition’ is expected to become the largest social and economic burden in the region. From 2014 to 2078, overweight and obesity are projected to cost on average $1 billion in Chile, $3 billion in Ecuador and $13 billion in Mexico per year respectively. The study recommends measures to mitigate this burden; governments should promote consumer education through clear policies and incentives to ensure reliable food labelling, physical activity initiatives, and the support of community-based nutrition education programmes. 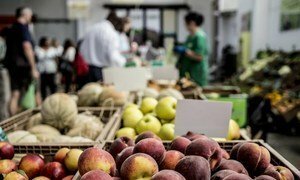 It encourages the food industry to work with governments to guarantee the production, availability, and accessibility of healthier food products, and to play a positive and responsible role in educating consumers on healthy food choices. Warning that new consumption patterns in Europe and Central Asian countries are leading to complex health challenges, the United Nations food security agency today called for policies tailored to the income and nutrition profile of these developed countries to prevent them from “transitioning” to new forms of food and nutrition insecurity.